shanghai bike polo: bike polo round 3 !! thanks for a great turn-out to last nights 'low-key social event'. a bunch of games were played, laughs and beers were shared, and new friendships were made !! 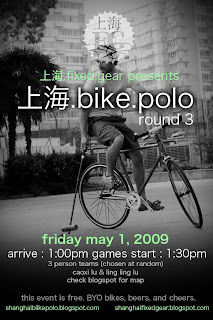 come out THIS friday, may 1st, for the official 3rd round of shanghai bike polo !! yes, friday is a holiday, let's enjoy that sunshine ! !